Jimmy Kimmel has set his sights on U.S. Senate candidate Roy Moore. The late-night host fired off a tweet on Thursday afternoon in response to a Breitbart article that Moore shared moments earlier with his nearly 68,000 Twitter followers. 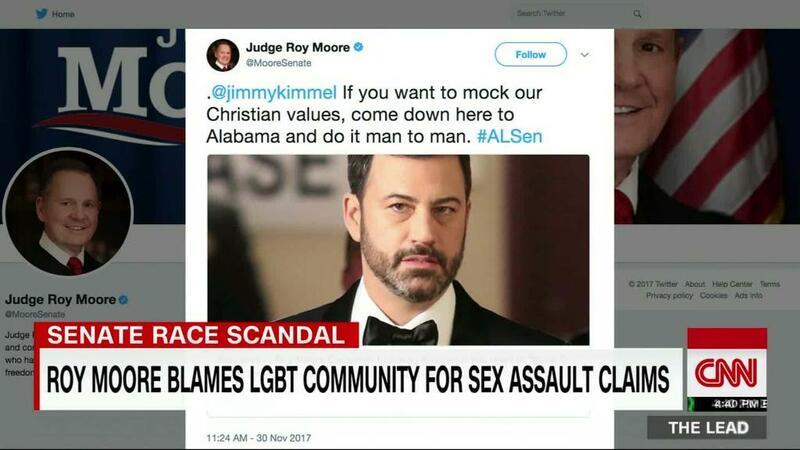 The Republican candidate called out Kimmel in his tweet saying, "@jimmykimmel If you want to mock our Christian values, come down here to Alabama and do it man to man. #ALSen." Without missing a beat, Kimmel tweeted back, "Sounds great Roy - let me know when you get some Christian values and I'll be there!" The Twitter spat started after Kimmel dispatched "Jimmy Kimmel Live!" writer Tony Barbieri to an Alabama church, where Moore was giving a speech on Wednesday night. Playing the fictional character Jake Byrd, Barbieri appeared in the crowd shouting his support for Moore while others heckled and interrupted the candidate's speech. Sounds great Roy - let me know when you get some Christian values and I'll be there! Moore is running for senate out of Alabama amid accusations of sexual assault and that he pursued relationships with teenage girls while in his 30s. He has denied those allegations, calling them "completely false" and "dirty politics." In a video posted by AL.com, Barbieri's Byrd -- who appeared in a "Gimme Moore" t-shirt with the candidate's face on it -- is seen standing in front of Moore and arguing with protestors who were off screen by yelling, "The judge is a man's man" and "Does that look like the face of a molester?" The video then shows him being escorted out by security. "They're kicking out your number one fan, judge." he said to Moore as he was being led out. "Does that look like the face of someone who hits on teenage girls?" A spokesperson for "Jimmy Kimmel Live!" said that the segment will air Thursday night. Kimmel on Thursday tweeted AL.com's story, which was the first to report on Barbieri's stunt. The Breitbart article that Moore tweeted on Thursday afternoon includes a response from the candidate's campaign. "If Kimmel wants to mock our Christian values, he should come down here and do it man to man instead of hiding behind a camera in Hollywood," Drew Messer, a senior adviser to Moore, told Breitbart. CNN confirmed with Moore's campaign that Messer was quoted correctly. Barbieri's prankster character has been used multiple times on Kimmel's show, usually in field segments where he appears at major events, such as Donald Trump's inauguration, the 2016 Republican National Convention and the presidential debate in Last Vegas last year. Kimmel has taken Moore to task over the allegations of sexual misconduct lodged against him. "He was reportedly so flirtatious with young girls when he was in his thirties they put him on a watch list at the mall," Kimmel said of Moore during an opening monologue two weeks ago. "I want you to think about that for a second, how does a man in his thirties get on a watch list at the mall? What man in his thirties is even willingly going to the mall in the first place?"